The introduction of electronic data capture (EDC) systems in clinical trial data management and analysis triggered the promise of better-managed clinical trials. Over time, however, many organizations ended up with multiple EDC systems, legacy clinical data management systems and additional systems for managing different aspects of clinical data management and analysis. 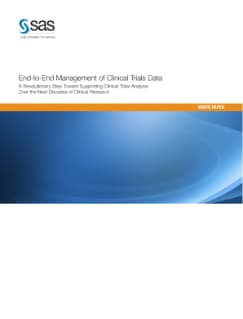 End-to-end data management using advanced data standards management, along with an integrated analytics and advanced in-memory visualization environment, is a revolutionary step toward supporting clinical trials analysis over the next decades of clinical research. This white paper discusses how bringing together granular, well-documented clinical data will lead to shorter trials, improve the modeling of new trials before a therapy is tested on a patient, and lead to higher-quality drug submissions to authorities.